Dharren Magbanua arrived in the United States from her home in the Phillipines in December of 2013, and now she is Employee of the Year at GatewaySCV member Golden Oak Adult School. Not fluent in English, timid, quiet, and anxious about learning English and fitting into her new home, Dharren began her journey at Rinaldi Adult School’s ESL courses without a car, often walking or riding her bike to school. 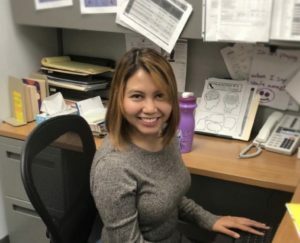 It was in these classes that Dharren made friends, gained confidence, and transferred to North Valley Occupational Center to earn a Quickbooks certificate, enhancing the bachelor degree in Accounting from her home country. As Dharren recalls, “When coming to a new country, if you do not speak the language and lack confidence, it is very hard to get a job.” In September of 2017, she was offered her third job in the United States as Accounting Technician II for the William S Hart Union High School District and became a team member at Golden Oak Adult School. Here, Dharren has found her passion and melds two worlds; that of the joy she receives from helping students along with the much-needed lifeline of accounting expertise. When asked about her goals, Dharren shares that with everything she has been through, it is time to “pay it forward, watch students learn, and inspire them in any way” that she can, just like she was inspired when she arrived in the United States. Dharren’s positive attitude, permanent smile and tireless work ethic are a by-product what she calls her “priceless opportunities”, and she remains grateful and excited about the possibilities for student growth and success at Golden Oak Adult School. Congratulations to Dharren!